Traditional, handmade, slow-baked rusks. The slow maturing and drying processes, and the selected whole grain wheat and barley grain varieties from which they are made, lend these barley rusks a unique flavor and aroma. Containing a mere 1.8% fat per portion (i.e. 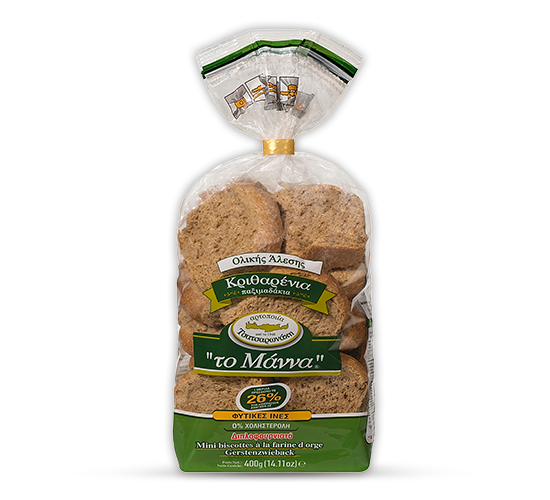 3 rusks), they also contain half the salt found in one portion of bread, while covering (26%) of the recommended daily fiber intake. They are particularly filling and digestible, since fiber combined with their hard texture retains a relatively high level of saturation. The high barley content makes them particularly beneficial for good bowel function while they are also richer in beta-glucans and minerals than ordinary whole grains. They are considered an ideal choice for those who wish to lose weight and/or follow a balanced, healthy diet. Their taste is so rich that you can enjoy them even on their own or combine them with other ingredients, making every meal of the day a special one.